Meditation is practised to attain the inner peace. Inner peace is dependent on a tranquil environment. Therefore to achieve good results from our meditation practice we need certain elements or meditation supplies to attune to our environment. Here is our list of essential meditation accessories and supplies, which we must have. Meditation Essentials: What are they? Whether you are getting these for yourself, or wish to gift them to a family member or friend, you cannot miss out on many of these fascinating products. These meditation essentials are divided into two categories; one is meditation props, which are used by the meditation practitioner directly during the meditation, such as a meditation cushion or pillow, or meditation bench etc. The second category is meditation accessories or supplies, which creates the tranquil environment for meditation, such as a singing bowl, or incense sticks etc. Meditation begins with a correct body posture, to align all our chakras, and to focus on our third eye. Meditation is about controlling our body, mind, and senses to find the inner peace. It involves the five elements of nature. With our sedentary lifestyle, we are used to our comfortable cushioned chairs, or sofas, thus, when meditating it often becomes very difficult for us to sit in a posture for a prolonged period of time. Meditation props like a meditation cushion, pillow, or benches helps one to sit with the correct body posture for a longer duration without causing an injury. A good meditation pillow, cushion or bench is a must for any meditation practitioner. These supplies are a great support factor during a meditation. They provide the required environmental elements to bring that inner peace. A meditation accessory like a singing bowl creates that tranquil sound, which activates your third eye. Prayer beads help you to count your mantra chanting. Incense makes the air pure and activates your sense of smell. A meditation statue becomes the center of focus. Meditation stones or crystals are kept at right body points to open up your chi or energy centers. Thus, meditation accessories are for our five senses to be activated during a meditation session. Investing in good meditation supplies is a must for a fulfilling meditation session. Moreover, these meditation accessories are good for interiors of your home also, and adds an element of style to it. These are beautiful prayer beads consisting of 108 beads and one guru Bead, which is a must for prayer. The materials used are African tropical tiger stripes tree, and Vietnamese Nha Trang incense wood. Both these woods have the mild aroma of sandalwood. The beads of 8mm are big enough for counting, and look great when on your wrist. There are 108 beads in total, which are a must for chanting mantra. A sandalwood aroma is very peaceful, yet very subtle. 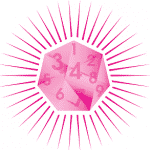 8 mm beads are adequate for rotating while counting mantras. The elastic string makes it perfect to wear around your wrist. It comes in 6 varieties: Black Rosewood, Ebony Wood, Vietnamese Sandal Wood, Wenge Wood, Blood Sandalwood, and Tiger Skin Wood. It is not original sandalwood, still excellent value for the price however. The beads are wound on an elastic string, thus, are quite close to each other. This makes rotating each bead on mantra difficult. The quality of bead is excellent for the given price, and they also look great! The six different variants will ensure that there is a color to suit your taste. 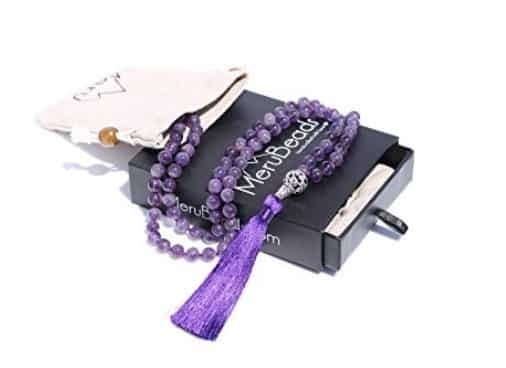 We highly recommend these prayer beads and can see why they are so well reviewed. 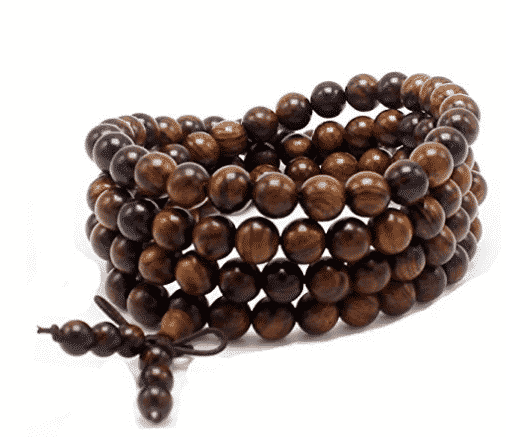 Prayer Beads can be made up of wood, earthen i.e. terracotta, or gemstones. Though you can use any one of these materials, still Buddhist meditation practices mostly prefer wooden beads. However those of you planning a trip to India for your next meditation camp will definitely want to have natural gemstone meditation beads as per their recommendation. This product from MeruBeads is made from natural gemstones, and comes in a variety of crystals like Amethyst, Rose Quartz, Tiger’s Eye, Garnet Red etc. Naturally procured beautiful and flawless gemstones. Comes in a variety of options like Rose Quartz, Tiger’s Eye, Amethyst, and Turquoise Blue etc. It comes with a free cotton carry pouch, which is also hand made. 108 beads, perfect for counting mantras during chanting. Each bead is knotted, to allow ease of rotation during each mantra chant. The silk tassels comes loose with regular wear and tear. The color of the natural gemstones may vary from the images given sometimes, but that is because of their natural color. These crystal meditation beads are must haves, and rather become a collectable item. Many of you may love to collect them all, as each gemstone looks beautiful, helping to compliment your mood or other meditation accessories. The price is excellent for natural gemstones (which has a real weight to it). 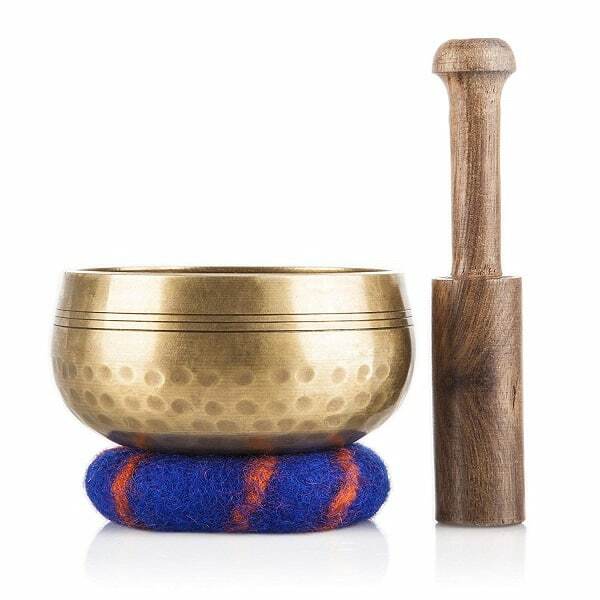 This is a beautiful Tibetan singing bowl made up of a meditation bowl, hand sewn cushion and wooden hammer. The bowl is about 4 inches in diameter, and is hand hammered. It was made by Nepalese artistans in the Himilayan foothills. This product creates an ambience which is perfect for emotional calming and healing. The unique tones generated by this bowl allow for deep meditation. The bowl is made up of Bronze, which makes it quite sturdy. The notes of the bowl are very peaceful and vibrations from a bronze bowl are considered auspicious during meditation. It comes with a free hand-sewn cushion for the bowl. At less than 4 inches, its diameter may be considered a bit small for a singing bowl. However it fits perfectly into the palm on your hand. This meditation singing bowl is a must to generate vibrations, which attune your mind, and bring peace. This Ohm Store Tibetan Singing Bowl is a beautiful piece of art, and is offered at a very reasonable price. This is one of the essential meditation supplies, and comes recommended highly by hundreds of happy owners. Satya Incense is one of the most exotic and perfect herbal incense, which is hand-rolled in India. This incense is most sought after in Meditation Communities around the world. 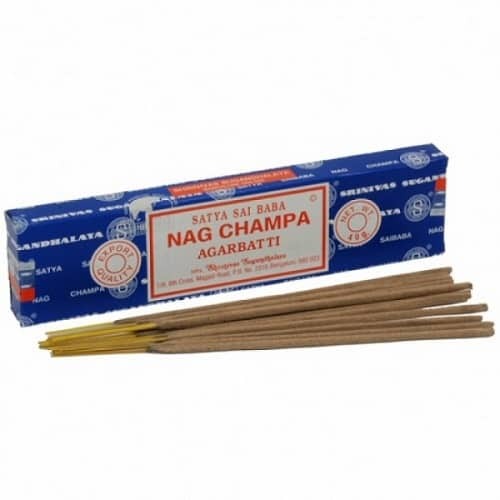 It comes in more than 12 varieties and aromas, but the most famous one are Nag Champa and Meditation. If you are really serious for a tranquil environment for meditation, then you cannot miss this particular incense. Though Low smoke, still not recommended for those having breathing problems. Satya Incense has become synonymous with Meditation world-wide, thus, you cannot miss out on its incense. This incense is actually a best buy, at this price. Even though it is quite famous and in demand, it is priced low for the benefits of meditation practitioners. We highly recommend this particular incense to enhance your meditation experience. 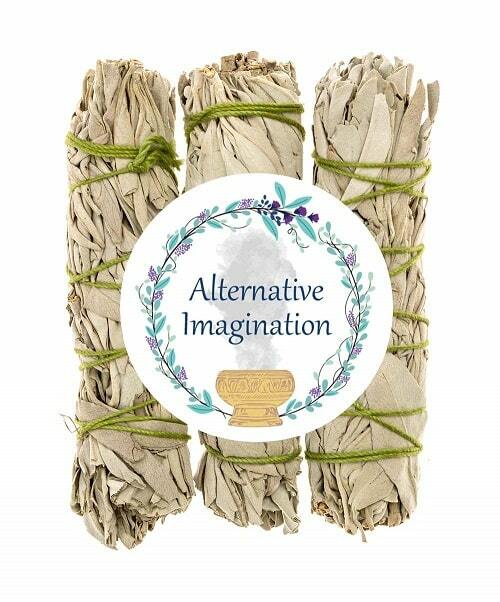 Smudge Sticks are natural herbs to be burned as incense. These meditation accessories have been used since ancient times for cleansing the air, and for their medicinal properties. California White Sage Smudge is a must buy for those who wish to cleanse their home or meditation room regularly for a peaceful environment. This particular one comes with an Abalone Shell, a wooden stand, and 3 smudge sticks. Natural California White Sage smudge sticks of around 4 inches length. No chemical or other harmful material is used. Beautiful abalone shell is included to burn the smudge. Wooden stand is also provided to hold it above your floor, or wooden table. A complete smudging kit is there, no need to buy separate items. It causes more smoke than herbal incense. Fragrance is not as strong as herbal meditation incense. Smudge Sticks are essential meditation supplies, and also for those who look for healing accessories. This one is a complete set, thus, a must buy to complete your meditation Kit at Home. 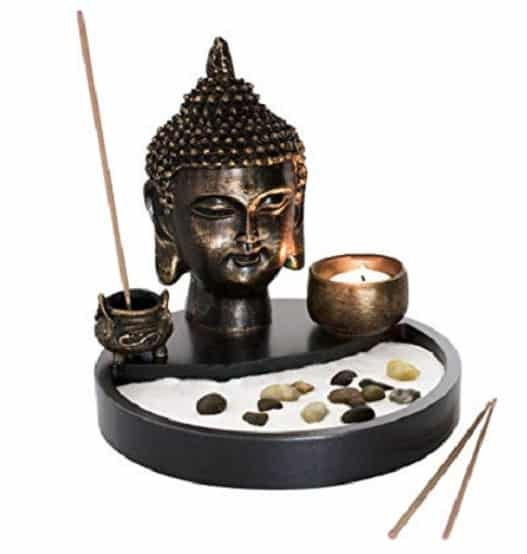 Meditation Accessories includes an Incense Burner, Candle Stand, and also a Meditation Statue. How nice it would be, if we can get all three at the price of just one! This one is just what you wished for. This is an Incense Burner, with a Candle Stand, which comes along with a copper alloy Buddha Statue. A Zen Garden is an added bonus to the offering. Three in one design with Incense Burner, Candle Stand, and Buddha Statue. It also has a Zen Garden with white sand and crystals. Bronze Color looks rustic with black color wooden table. The size 6X6X10.3 inch is a bit small for all three things to be put on same table. The incense holder holes are a bit small, therefore a few incense sticks won’t fit in. Rarely do we find a work of art, which has such a high utility value. This Buddha Statue and Zen Garden is one such work of Art, which fulfils not one or two, but three requirements of your Meditation Kit. We highly recommend this one too. The price range is reasonable. This one is a multi-incense burner. You can burn an Incense Stick, Incense Cone, or even an Incense Coil in it. It comes with a perforated Cap, to allow the aroma to spread, but contains any flying ash or sparks within. Therefore, it is safe to use, and easy to clean. It can be used to burn any kind of Incense. Beautiful Lotus Shape, along with Crystal adorned perforated Cap. It contains the flying ash or sparks inside, the cap acts as a safety measure. As the ash remains inside, it is easy to clean. Beautiful Carvings on the outside. Only one Incense Stick can be burned at a time. 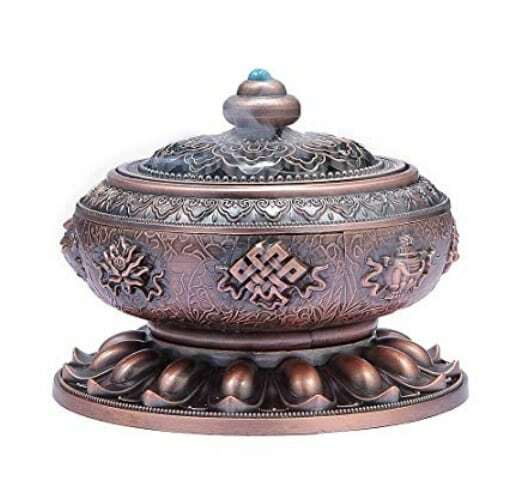 If you wish to buy an Incense burner only with no other attachments, then this one is perfect, as it work well. It gives you all the burning options of incense. A must buy of the meditation accessories to keep in your kit, or even just to look good on the table or desk. A Crystal Sphere is an object of focus during a meditation session for some. This one made up of Black Obsidian is a beautiful object for Meditation. Its size varies from 30 mm diameter to 190 mm diameter, and you may select the size as per your needs. It comes along with a wooden stand and a beautiful Velvet Pouch to carry. A black Obsidian is believed to absorb negative energies and remove emotional blockages during a meditation, and hence, most practitioners prefer to keep one in their meditation room. Natural Black Obsidian from Mexico and not some dyed stone. Hand Crafted wooden stand, and not made up of plastic or resin. Beautiful Velvet Pouch to carry it with you. Stone is polished to mirror finishing. A few Meditation Camps do not allow Black objects in their meditation session. A Crystal Ball or Sphere is one of the essential Meditation supplies, and for those who are serious about their Meditation practice usually carry one with them. This Black Obsidian is a perfect match of Craftsmanship and beauty. 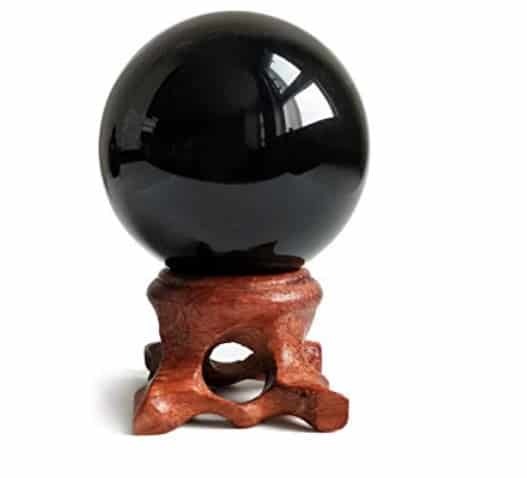 For those who do not prefer a Black Meditation Sphere, this one comes in different colors, and is made up of Crystal which is not naturally procured. 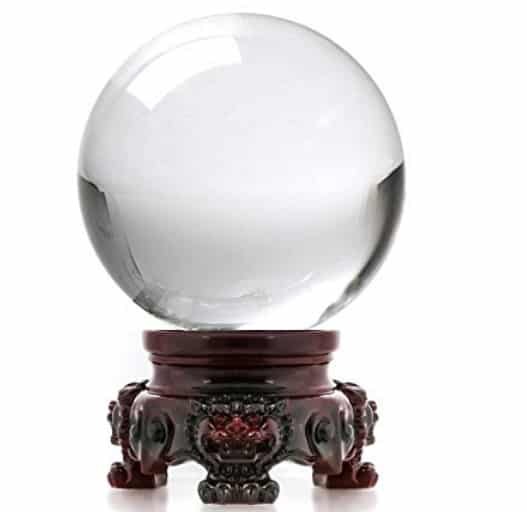 This is a clear crystal ball for meditation gazing, and to refract energies in a meditation room. It comes in 10 Bright colors, and is of 80 mm diameter. A redwood resin stand comes along with this Crystal Ball. It is a transparent and clear crystal ball. Comes in bright 10 colors, which are not possible with natural crystal spheres. It is not made up of naturally occurring crystal. Hence, it doesn’t add any energy to your meditation room. Stand is made up of resin and not natural wood. As a Clear Crystal Sphere it works beautifully to engage one in a Meditation Gazing exercise. As it is clear, hence, it gives a hue which looks beautiful, and reflects light. It is not only a piece for your meditation kit, but also add element of serenity to your interiors. 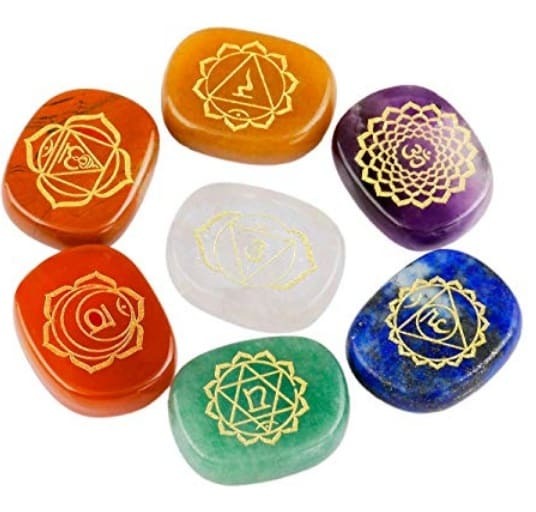 For all those who are engaged in Chakra Meditation, or going for a Chakra Meditation Camp, carrying a 7 Chakra Meditation Stones set is essential. This beautiful set of 7 naturally procured crystals which are engraved with vedic symbols of 7 Chakras is a unique Meditation Accessory. These stones come in different shapes and sizes, like a Square, Heart and Pebbles. They are engraved with different types of symbols used during different Meditations, such as Vedic Symbols, Zibu Symbols etc. Naturally Occurring Crystals and not an artificially made one. Comes in complete set of 7 crystals for 7 Chakras. Color of stone and symbols are matched as per the 7 Chakra Meditation. Literally no short-coming or cons for these crystals. They are just perfect. These meditation supplies are hand-picked for 7 Chakra Meditation, which is quite a trend nowadays. Any person going for 7 chakra meditation should consider this beautiful set. The price is so tempting that you won’t be able to stop yourself in buying more than just one set. Meditation Pillows come under the category of Meditation props. To select a good meditation cushion or pillow is a tedious job, as it comes in different shapes, sizes, and even filling material. This one is hand-picked by us for you. It is an inflatable Meditation pillow, which comes with a pump to inflate and deflate. There is no worry of it being spoiled or changing shape. It has three different chambers, to adjust air according to your sitting posture. You can deflate it to carry along, and therefore it is quite portable. An innovative design based on different needs of users. Three Inflation Chambers for dynamic cushioning. It doubles up as a travelling pillow. It has 6 different color options. Crescent Shape for better posture. It comes with a pump and a carry bag. 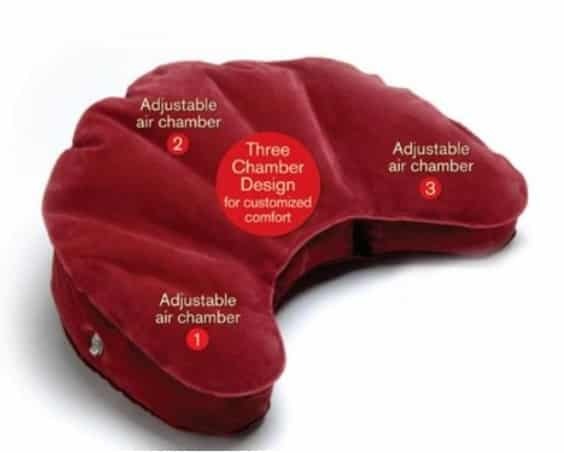 Meditation Cushion with air inflation usually have shorter lifes due to their air seals getting worn with time. This particular Meditation pillow is good value due to its innovative design, and provides an excellent experience for your session. This review was meant to help all those new to Meditation or those who are looking to gift something related to meditation to their relatives and friends. The Meditation Accessories selected were picked so that even a person with no prior knowledge can buy them without any regret. It is a complete list of accessories and meditation supplies, which one can buy. This list should also serve as a great starting point to create your own essential meditation kit.